Thursday January 17th 1878 I worked hard on Mollie's dress and got it nearly done by bed-time. Mrs. McCleary and her daughter Mrs. [Orkutt?] spent the day here. Weather pleasanter. 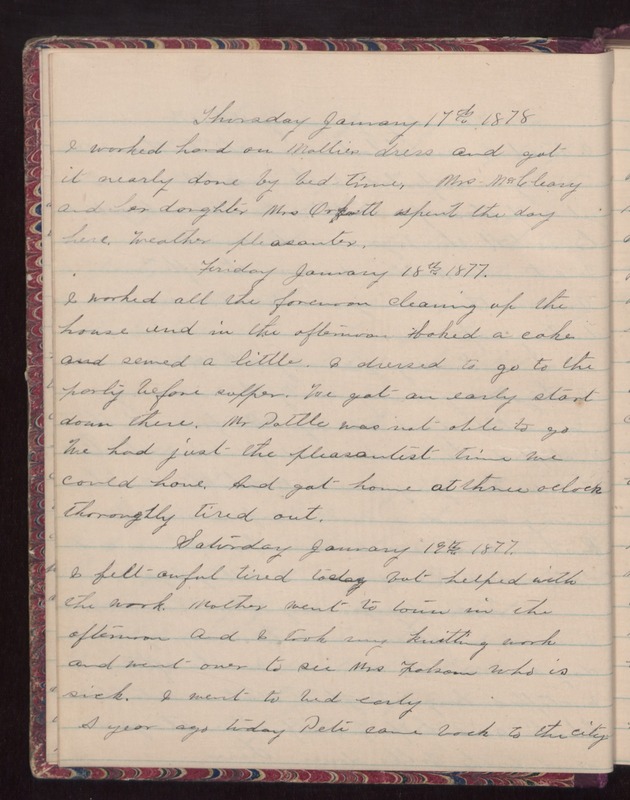 Friday January 18th 1877 I worked all the forenoon cleaning up the house and in the afternoon baked a cake and sewed a little. I dressed to go to the party before supper. We got an early start down there. Mr Pottle was not able to go. We had just the pleasantest time we could have. And got home at three oclock thoroughly tired out. Saturday January 19th 1877 I felt awful tired today but helped with the work. Mother went to town in the afternoon and I took my knitting work and went over to see Mrs Folsom who is sick. I went to bed early. A year ago today Pete came back to the city.